My introduction to the competitive world of amateur sports started when my good friend and I, Ryan Hensley joined a beer pong league hosted by San Diego Beer Pong. When we joined we were some of the best players at our house parties and wanted to test our skill against real competition. During our first league we were terrible, but we improved quickly and during the second season we were able to capture second place. After a year or so of attending leagues and weekly tournaments, SDBP stopped hosting events. After some time of no competitive tournaments in San Diego, Ryan and I started SD Pong Circuit. We started working with venues for no charge as we were trying to build a base of players and prove our worth. After about 3 months we teamed up with another organizer who was running successful events in East County San Diego, Daniel Grover. After our partnership, and successes at weekly events, we went back to the venues and set up a system for pay based on attendance. Today I have been running SD Pong Circuit for over 6 years with 1063 tournaments and counting! 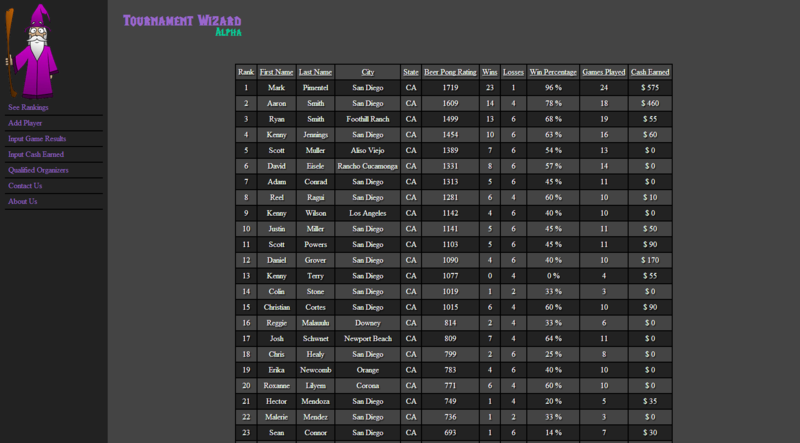 I started working on Tournament Wizard in the winter of 2014 with two goals in mind, providing amateur sports with a unique and simple way to keep player stats, and to provide businesses with the tools needed to successfully promote and run tournaments/league nights in any sport imaginable. In beer pong we have an annual event called the Best of the West. In the BOW teams are made up of the top 10 players from each city/region to compete against other west coast regions. While this is an amazingly organized and well run event, I often felt that the top players were not being chosen for the team due to bias and not their actual performance. Because we had no ranking system in place, it was impossible to really know how good someone was without actually watching them play over dozens of tournaments. A national ranking system that was simple to implement was something that was solely missing from the beer pong community and amateur sports around the world. Tournament Wizard had to be extremely easy to use and overall make life easier for players as well as their tournament directors. During the Alpha proof of concept, we created a python simulation of a full beer pong game given player shooting percentages. It worked, players loved seeing their ranking and stats and attendance at events slowly started to grow despite how crude the webpage looked. After the alpha success, I went with a professional development company to build the website from scratch. After about a year and half of development we had finished the beta period and in September of 2015 we launched Tournament Wizard. Quickly we began getting organizers from all around the world and varying sports making accounts and hosting tournaments on the website! In March of this year we launched our iPhone and Android mobile apps. This update added push notifications for players, live brackets from the palm of their hand, rankings and stats on the fly, and automated promotion for organizers and venues. With the addition of the mobile app the website had finally achieved my full vision of what the website should be. Since then I have partnered with organizers around the country and beyond who use the website for their local and regional events. The purpose of this blog is to show you that I’m not some huge corporation, I’m an organizer and entrepreneur like many of you. I need your help to grow the website and amateur social sports globally. If you haven’t already, make a free account on the website. Tell your friends and businesses about the website. And go ahead and check out the websites premium ranking and stat tracking features which allow us to keep the website going. Share this with local organizers and venues who host amateur sport tournaments!